SALEM, Ohio — With all the natural gas that’s been drilled in Ohio and Pennsylvania the past couple years, there’s a growing interest to get more of it into vehicles. Diesel and gasoline prices remain near record highs, while natural gas, priced at just more than $2 per gasoline gallon equivalent, could be a significant cost-saving opportunity. Ohio currently has a dozen public-access CNG stations, according to industry sources and Clean Fuels Ohio — a statewide industry coalition. Pennsylvania has 18, according to the U.S. Department of Energy. Although CNG costs less per gallon of gasoline, it’s considered about 10 percent less efficient. However, it is much more cleaner than conventional fuels, reducing emissions by 50-70 percent. CNG has 95 percent less particulate matter and carbon monoxide emissions, and 80 percent less nitrogen oxide emissions than conventional fuels. Kirt Conrad is CEO of Stark Area Regional Transit Authority, which installed a public-use CNG station in Canton in May 2012. Over the past year, he’s seen a wide range of vehicles and fleets line up at the station, located at 1600 Gateway Boulevard — landscape companies, waste collection companies and a host of personal vehicles, including the Honda CNG Civic. The gas feeding the SARTA station comes from an existing underground natural gas line. Before it can be dispensed, it’s run through a large compressor and stored in thick metal storage tanks — all enclosed by protective fence. 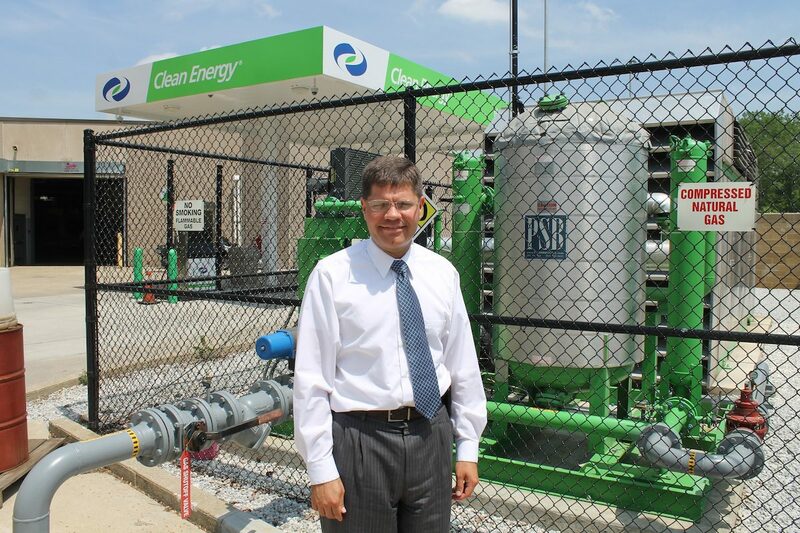 The facility is owned by SARTA, but is maintained by Clean Energy, a major supplier of CNG stations. SARTA operates about 30 CNG buses and three CNG Civics and said the cost savings are significant compared to diesel fuel. It takes just a few minutes to fill most vehicles at the station, and they run about the same as conventional fuel vehicles — just with more savings and less emissions, officials say. More stations, more vehicles. Other stations are slowly springing up, including a larger public filling station at Smith Dairy, which opened in August. The cost of opening a public filling station is usually a half-million dollars or more, and Smith Dairy opened its station with its own money. Conrad said the more stations that open, the better, because it means more people are buying CNG vehicles and entering the market. “If we can have 10 CNG facilities in Stark County, that’d be wonderful, because that would mean everybody in their garage is thinking (CNG),” he said. Location plays a big part in whether the conversion to a CNG engine, or buying a vehicle that is already CNG fueled, is economical. Scott Shearer, chair of Ohio State University’s Department of Food, Agricultural and Biological Engineering, said farmers who live close to the stations might find it more viable. But if you have to drive long distances to fill up for less, it could defeat the purpose.Another big factor, he said, is how many hours a farmer uses the tractors or other vehicles in question. In the case of a grain farmer, it may be only during planting and harvest season, and potentially for long periods of time per day. There may not be a sufficient break to travel for a refill, and there are considerable transportation issues if the fuel is to be transported to the farm — including regulations and overall logistics. “The question is what quantity are you moving, what are the limitations for moving that fuel. There become a whole bunch of ‘other’ safety provisions that become pretty important,” he said. Smaller, residential-size natural gas compressors exist for homesteads and farms, but they often take several hours to fill an engine’s tank to capacity and are still costly, at $5,000 and up. But Shearer isn’t writing off CNG on the farm. He said some operations, like dairies, may very well run certain tractors enough hours per year to justify the expense. “I think when you look around, there’s going to be some enterprises that are going to be well-suited toward that kind of thing,” he said. Brad Couch is the CNG business development manager at Ariel Corp., which built its 40,000th gas compressor in December and bills itself as the world’s largest producer of such compressors.None of Ariel’s compressors are the smaller, farm-sized units, but Couch said he believes they could be coming in the near future, and at prices anyone could afford. “This is certainly very preliminary,” he said, but noted the benefits CNG fuel will bring, including about half the price of conventional fuels, fewer emissions, and more money staying in Ohio and the United States. When a person buys CNG, compared to diesel or gasoline, “the dollars he is spending is going right back to folks in Ohio,” Couch said. He identified two major sources of natural gas for CNG. The obvious drilling of natural gas, as well as biodigestion of organic matter, being conducted by companies like Ohio-based Quasar Energy. Quasar operates a digester facility at Ohio State University’s Ohio Agricultural Research and Development Center in Wooster that is capable of turning ag and food waste into CNG, and has similar facilities in major cities across most of Ohio. “Because there typically is an organic waste stream of some sort (on farms), why not biodigest it,” Couch said. He noted that biodigesters can be a costly investment, as well, but one that can be overcome when large farms, or multiple farms, pool resources. With CNG — as with any new source of energy — there are safety concerns and handling practices to learn, but most industry professionals say it’s fairly simple. In order for natural gas to ignite, it generally has to accumulate in dense quantities. On the farm, as long as there are vents in buildings and open doors, minor spills dissipate and aren’t an issue. CNG fuel tanks undergo rigorous testing and are designed to withstand high pressures and potential accidents. Coach said a big safety concern of CNG is respecting the pressure of the material. Just as a pressure washer can damage skin at 2,000 psi or more, so can CNG, which is often pressurized at 5,000 psi and up. Next articleWhat price of corn is needed to make ethanol blends competitive?